I am currently doing the 21-day Fix program. 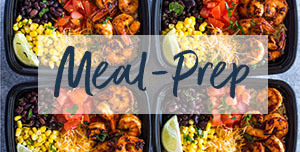 Do you know what the serving size is and containers used? Thanks! Will you post video of how you folded burritos. I need practice with that . All mine fall apart. I did notice u added Zuchinni or some sort of vegetable in the 1st pictures there of ingredients ? i bet that was yummy or not ? if u left it out of the recipe.. My hubby loves wraps , and we buy the carb balance wraps in place of the reg . ones u use !! I cant wait to try this .. thanks so much !! The circles that look like zucchini are avocado slices. Zucchini does sound good though! How would you freeze them? 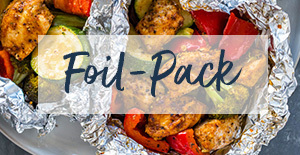 Would wrapping in foil be good enough? Would Ziploc bags be better? I don’t have a sealer or anything like that. Thanks! I like to store them in ziplock bags but plastic wrap works as well. I love avocado. How is the avocado after being frozen? Is it black and slime or does it hold up well? Tried these tonight & thought they were quite tasty. I actually added about 1/2 – 2/3 c sour cream to the mix as well. Next time I may add a little more cheese & use a bit less avocado as that’s really all we could taste. Thx so much for a yummy new recipe! These look absolutely delicious! and healthy! Will definitely be trying these tonight! Not real informative on how the chicken should be cooked. Do we need a rub in it? I wouldn’t know because this recipe is uniformative…. You can use any cooked chicken you have on hand or rub your favorite spice mix onto chicken breasts or thighs and cook until tender. 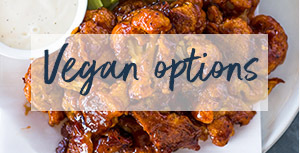 Here are a few recipes I have on the blog for chicken but the possibilities are endless! Jesus Christ…use some imagination, Sheila. No need to be so goddamn rude. I just sprinkled some pepper and Mrs. Dash on my chicken. It was delicious. How many calories are in this Chicken Burrito Wrap? 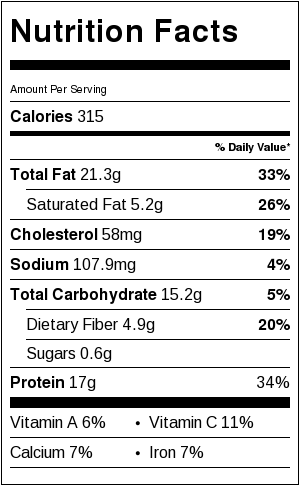 Just uploaded the nutrition facts. It’s 315 calories each! I am guessing you ment Monteray Jack cheese, not Mozzarella. 😉 Also did you grill them after filling them…or how did you get the grill marks? Looks amazing! Ehh I think mozarella would work better but thanks for being kind about it you guys rock this was the best recipe EVER!!! Thanks love this website I am going to try every sing recipe on this website!! ???????????????????????????? A grill pan will leave the marks. I use my grill pan 3-4 times a week. To cook from frozen state, do I first have to thaw, before cooking ???? Thank you. Yes, you can microwave them for a few seconds. Sorry. Just saw your posting of the nutritional info and My Fitness Pal was right. Amazing. Do you know the calorie count on one of these? Thanks! These sound delicious. I have some left over rotisserie chicken in the refrigerator which will be perfect. Will be trying them soon. How does freezing them effect the avocado once you thaw them? Chicken burrito is really a good recipe. This is very delicious, healthy and can help you lose some calories. Yummy!! I’m not a fan of cilantro, but I knew I needed to get flavor into the mix. I had a package of guacamole mix so I added a little of that to the chicken/cheese/avocado mixture. Delicious!! Added 3 green onions, as well. Will definitely be making again! These are great! I suggest baking them with a little olive oil brushed under and on top @400°F for 20mins. Next time I think I’ll mash up the avo with some lemon, salt, and garlic powder and add some taco rice and/or black beans! 🙂 Thanks for the yummy idea!! Did you fry first or after baking? Or just baked? p.s., just in case you happen to see this right away – I’m actually about to cook these now, and don’t know what to do because now I want to make them how you said, for that crispiness. If you are ABLE to respond right when you get this, please do? You’re amazing. Thank you. They aren’t fried. They are crisped in a pan on the stove-top. Please refer to step 3 of the recipe. I have made these twice so far. I dont like cilantro but I figured you could put anything in these. Here is what I added to original recipe minus the cilantro. This is great on the BBQ so now it is on our camping menu. Thanks for all the tips Belinda, I will be sure to try these combos next time! 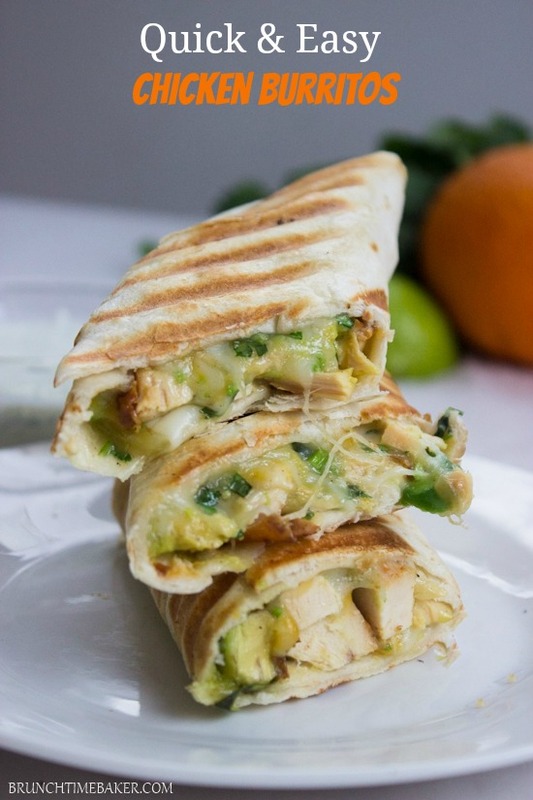 I am a huge fan of the chicken and avocado burritos and like all of the ingredients. Have you any idea of the nutritional info? I was starting to figure it out, but pretty sure that someone must have already. I found it in MyFitness Tracker, but can’t imagine it’s so low in calories (175). Thanks. Such an awesome chicken meal, I’m really glad I found this post. 🙂 Is this also good with beef? they look sooooo yummy! Love mexican food! I’m definitely making these tomorrow!!! Okay… I am officially hungry now.But its after dinner time in Germany 😀 I guess this has to go on the meal plan! Are they normal large tortillas or the size of chipotle? I don’t know if I should use 8″, 10″, or 12″. These were super delicious and really lived up to the name! 🙂 My filling didn’t look nearly as cheesy as yours and I used the called for amount – nevertheless it was still very tasty. We served with sour cream. Thanks for the quick and easy dinner! Delicious! I put a little lime juice and it was a perfect addition! I have mint leaves, oregano, parsley, and thyme.. but no cilantro at home. Could I use any of the things I listed as a cilantro replacement? Darla, sorry it took me so long to reply. You can use parsley instead or cross out the herbs all together. It will still taste really good! 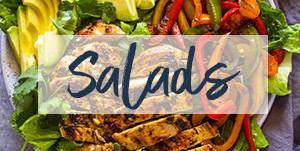 Easy, healthy, fillings and fun! I added some black beans and cumin and pumped up the garlic …. Thanks! Yumsters! How do you suggest reheating the burritos after freezing them? If you have already grilled them on the pan before freezing them then just place them in the microwave for 1-3 minutes depending on your microwaves strength. If you haven’t cooked them in the pan prior to freezing, then microwave them half way and place on the pan or griddle to give them a crispy exterior! The avocado tastes fine being heated? Yes it tastes amazing when it’s warmed with the cheese! Cooked these tonight and Wowza they were great! Do you have any idea in the calories in this fab dish? Catherine, I’m glad you enjoyed the Recipe! I’ve pasted the nutritional information below. Most of the fat is actually from the avocado; but it’s good fat. Mexican food…I’m lucky enough to have my own personal live-in (aka-my husband;)…he used to make amazing dishes all of the time sopes, chilaquiles, albondigas, gorditas, entomatadas, and molletes were all favorites at my house…and then after five years together he fiiiiinally told me he doesn’t like cooking! Oh, and we moved to China where you can’t get lime or avocado (oh the shame!) But cilantro and cheese we can! This looks yummy! You are so lucky that your husband can cook! I wish my husband can even make me a scrambled egg. As awesome as Mexican cuisine can be, I suggest you embrace the Chinese cuisine while your there! I wish I can visit there one day! I know! My husband only comes in the kitchen when he is helping make something for his friends! I crave Mexican food all the time too. I blame it on all the melty gooey cheese 🙂 These look incredible!!! I know!! I can’t resist anything with melted cheese on it! Hi Layla ! 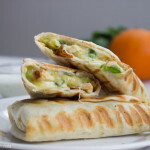 I just wanted to let you know that I will be featuring your quick and easy chicken burritos on my blog later tonight! Thank you so much for linking up to Creativity Unleashed! Gwen, Thank you so much for featuring my recipe! So glad you linked this at our Super Saturday link party. I think a double batch would be gone in a few days, if they lasted that long. 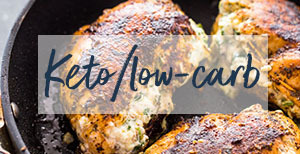 I love recipes like this that you can pull out of the freezer and have a meal in a pinch! 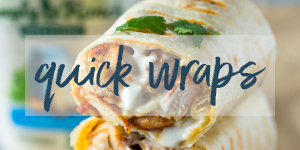 We are big fans of Mexican food too – especially my hubby 🙂 He would love these chicken burritos, they look wonderful and love how easy they are to prepare! Oh My, I need to buy a grilling pan! 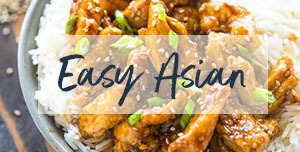 love the simplicity of this recipe, a perfect week day meal! Mexican food is my FAVORITE! Here in California we have tons of authentic Mexican restaurants, so I’m like a kid in a candy store. This is my kind of burrito. 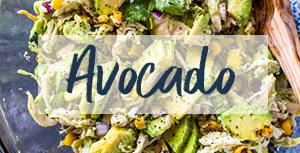 The more avocado, the better! Love the grill marks on this, makes it even more appetizing. At first I thought maybe you made it in a panini maker, which got me to thinking….that would be delicious too! Your so luck to have such wide variety Natalie! ha your just like me the more avocado the better!! I grilled it on a griddle that has the lines, I love the way it makes them burritos look! 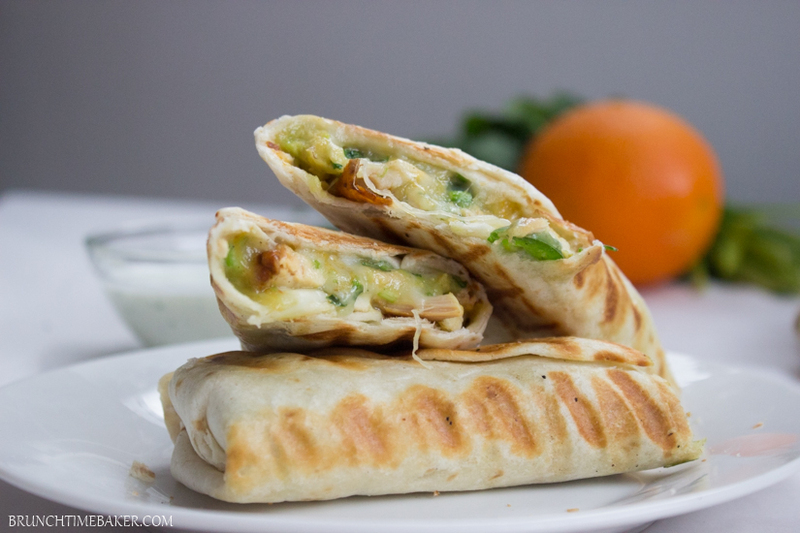 These burritos are what I crave this morning for breakfast!!! Is that strange? If that is weird, I’m happy to be weird. I love being in such wonderful company. Wear your weird proudly! Oh Mexican food, how I adore thee. It’s definitely all the melted cheese for me. And the spice. And everything. I really can’t resist cheese on anything! The more the better for me!